I think that every day - we can go with every hour - you get to choose where your energy goes. You get to choose where you're going to put your effort, and how you're going to direct your thoughts, and so on. You get to decide. 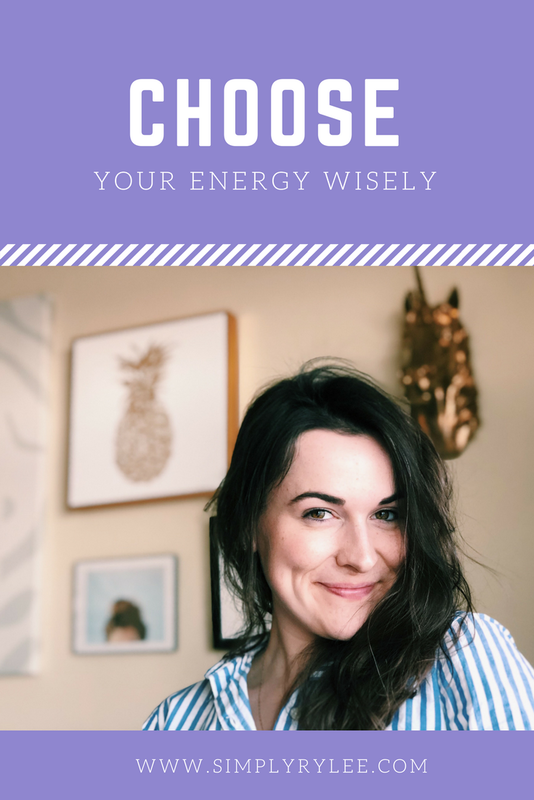 And so it is up to you to choose your energy wisely. Okay. We can put that aside for a bit now. So, I've been thinking a lot lately about who gets to have my energy. First of all, my energy is in short supply. I'm chasing a puppy around. I'm working full-time. I'm trying to, you know, run every once in a while and do my laundry once a week. Second of all, I'm starting to get into the mindset of...let's call it reclaiming my time. I know myself well enough to know when I'm getting run down. That could be because I'm getting sick, I have too much on my plate, or I just need to sleep more. But it's increasingly possible that I'm letting too much, take too much. Does that make sense? I'm feeling more and more like I ought to be more diligent in deciding where I spend my time and energy. I think it's far more important for me to take the time to make a choice - maybe every hour - how my time and energy are spent. Because that's the reality right? I'm spending them. And let's be honest, if the return isn't good, the spend isn't worth it. So, reclaiming my time (and energy.) Where does it start? Well, honestly, it started with looking at what was draining me. We've talked a little about how I've given up on caring about diets, fads, and running myself ragged for a body type that's not worth my energy. And that's been huge. Giving up listening to the voices that yell and scream false facts about "health." Giving up pretending that any diet is a "healthy" diet. Giving up restricting foods - any foods. Yeah girl, I eat McDonalds, and two desserts, and whatever the heck else my bangin' temple wants. Because it takes something from me, and there's no return. Giving up people that take from me, and don't have anything to give. That, that was harder. But dang it was good. And it is a tight line to toe, I know. I know I've said a lot about giving until it hurts, and serving others, and being present when the only thing for you to do is give who you are. And I stand by all of that. But I realized - maybe last year, who knows - that there will be people that take, and only take. There will be people that are there to take your energy, take your time, take your kindness, take your joy and keep returning with empty hands, looking for more. Those are the people that had to go if I wanted to reclaim my time. I had to walk away, say no thank you, and put up some blinders - because my energy was worth more. And I think that's the hardest part, saying that something about me - time or energy - is worth more. Worthiness is hard to begin with. Recognizing your own? Claiming your own as something that is deserving? That takes effort - a lot of it. And time too. So, I gave up ideals that aren't good for me. I gave up people that don't show up for me. And I made the choice that my time and energy are actually worth something. I still get tired. I still have to make choices about these things every day. But I worry less that I am wasting my time with things that don't matter. And I feel less and less drained by my life. I won't say it's a perfect system, it's not. But I will say that knowing what has to go is powerful. And knowing that the things that are in your life are things that you choose to invest your time and energy into, makes them all the more valuable.